Back in the early 90’s, I was participating in a study abroad program for a college course I was taking. I was a biblical studies major with a focus on missions, and the country was Romania. Romania is, as it was in the 1990’s, an interesting place. Although my attention was on missions, the broader topic of my study in Romania was on cultural sensitivity and cultural inclusion. Before leaving the United States, I studied, as best I could from the available books, the culture of Romania and her people but upon my arrival, the study went into high gear. Romanians, by and large, live off the land. The country was once called the “bread basket if Europe” since they produced much of the food for Europe, but due to poor farming practices over the last generation that had changed. What had not changed was that bread was a large part of every meal. No matter where you went, bread was baking. Driving through the street of Bucharest or some small village in the Carpathian Mountains, bread was baking in small and large bake shops, and people stood in line each morning for the fresh bread that would last them the day. In the villages of the countryside, the first item on the agenda of the day was to bake bread. To Romanians bread was life and to not have bread with a meal was, well, to not have life. Bread is central to Christianity as well in the form of the Lord’s Supper that we celebrate as one of the two Sacraments of the Church. We do not believe that anything changes about the bread and the juice that we serve when we pray over it, but I think that it becomes sacred in the sense that it is through those simple elements of the earth, bread, water, salt, yeast, wine, or juice, that we are drawn closer to God and each other. When we, as a community celebrate the Lord’s Supper, it is a sacred moment of communal worship. The Greek word that forms the English word Eucharist comes is derived from two Greek words, eu, meaning well and kharis, meaning favor or grace. The word Eucharist means “gratitude.” Bread is blessed and shared, to remind us that food is sacred and it gives life to our bodies and is a gift from God grown out of his creation. Wine or juice is blessed as a reminder that drink comes from God, it is a gift that brings joy and warmth to our souls. Jesus reminds us in the passage of scripture we heard tonight that He is the bread of life. Jesus is the essential part of our lives, and He is a gift from the Father to us. Jesus also reminds us that whoever eats of the bread will never hunger again, not in a physical sense but a spiritual sense. We come to Him, spiritually and communally, and get our fill of Him and His Word as a gift from God and we are to take that gift and give it to others. One of the spiritual gifts I have received from my coming to the Congregational way of life is that the table of the Lord’s Supper is open to anyone to come. In many, many churches communion, Eucharist, the Lord’s Supper is used as a weapon or a way to divide the Congregation. You can only partake if you are a member of the club. Sadly, I used to believe this and then I meditated on the scene of the Last Supper. All of Jesus’ disciples were present with him in the Upper Room that night. All of them. Peter who would deny him, the others who would run off and desert him at his hour of need, and Judas, the one who would betray him and hand him over to death. They were all there, and they all participated. Jesus gave himself, spiritually through the elements of bread and wine, to everyone, even those who would destroy him. What a powerful message this was to me. We come to the table of the Lord not because we are prepared but to be prepared. 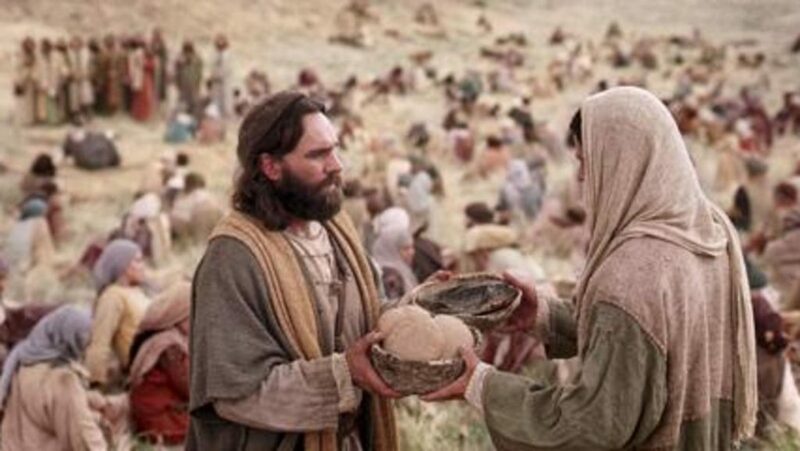 We come because Jesus is the bread of life and if we eat, we will never hunger again. We come to the table not as individuals but as a community, and we receive, and we eat together, as a community, and we are satisfied as a community. Jesus commands us to do this in remembrance of him but what is this “this” that he is commanding us to do. Jesus is commanding us to break ourselves open for others. To share the gifts we have been given, large and small, with others. Jesus is commanding us to share our lives with others and to allow them to share their lives with us. Our gratefulness comes when we see the Christ in others, and we allow others to see the Christ in us. Jesus IS the bread of life, and all who come to him will never hunger or thirst again. Ask yourself this question this week, am I leading people to or am I driving people away from the food that will satisfy them? Am I building walls to keep people out or am I clearing paths that will allow people to come and receive all they need? Jesus IS the bread of life and whoever comes to him (notice there are no qualifications) will never be hungry and whoever (notice no qualifications again) believes in me will never be thirsty.